www.tnpsc.gov.in/ www.tnpscexams.net/ www.tnpscexams.in. The online application forms are available from 03-10-2018 onwards. The Last date for submitting the application form through online is 31-10-2018. Candidates will be shortlisted on the basis of merit in written examination. 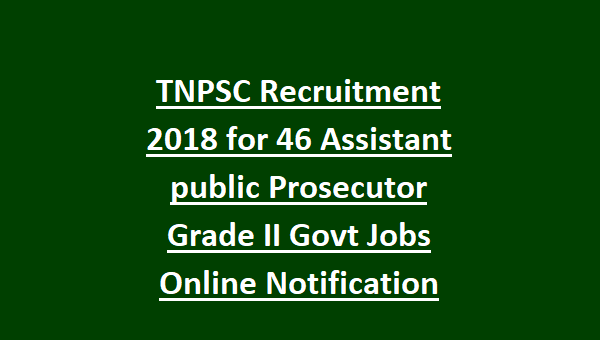 For the other information of age limit, educational qualification, salary, selection process and how to apply are given below for the Assistant Public Prosecutor Posts in TNPSC Recruitment Notification 2018. There are total 46 available vacancies for Assistant Public Prosecutor Posts in TNPSC recruitment 2018. There is no age limit for SCs, SC (A), STs, MBCs/ DCs, BC (OBCM)s, BCMs and Destitute windows of castes. For others upper age limit should not exceed the 34 years. And must have had active practice in ‘criminal courts’ for a period of 5 years. The salary offered for the selected candidates is Rs.56100 – 177500/-. The candidate’s registration fee is RS.150/-. Preliminary Examination fee is Rs.100/-. The main written examination fee is Rs.200/-. Candidates can pay online examination fee through Debit card, Credit card, Net Banking. It can be paid offline at State Bank of India/ Indian Bank with in two days from last date of form submission. The last date for payment of fee through Bank is 02-11-2018. The candidates will be selected based on the written examination. The Preliminary written examination paper will consists of all objective type questions of total 100 questions for 100 marks with duration of 2 hours. For more information candidates will refer in the official notification. The date of Preliminary Examination is on 05-01-2018 at 10:00 AM to 12:00 Noon. The date of main examination will be announced soon. 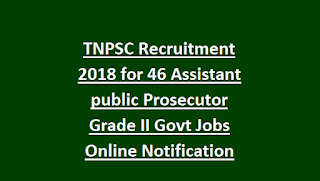 Interested candidates can apply through online mode for Assistant Public Prosecutor Posts in TNPSC. The official website of TNPSC for applying these posts is www.tnpsc.gov.in. The online applications will start from 03-10-2018. The last date to submit the application form through online is 31-10-2018. It is mandatory for candidates to register their basic details through one – time online registration system. The candidates can pay the application fee at the time of form submission.